We closed Monday in a positive frame of mind. The shape of the vintage on the Left Bank was beginning to come into focus, where ripeness and succulence are to the fore, and with intensity and complexity in evidence at the good addresses. The soils of the Left Bank are principally free-draining gravels with sand and some clay and so there remained the sense that, for all the exuberance of the wines tasted on Monday, there was still a component that was waiting to make an impression, usually detected in a variety of guises: freshness, acidity, vivacity. Tuesday was spent exclusively on the Right Bank, in St Emilion and Pomerol. St Emilion’s greatest vineyards crowd the limestone and clay slopes – the Côtes – that roll around and down from the town of St Emilion. Limestone is a cool, alkaline medium and it acted as a superb moderator in the arid warmth of the 2018 vintage. It is water-retentive as well, which means that there was little risk of hydric stress in 2018 for vines grown on those soils, although mildew was still a major challenge in the first half of the year. The other factor to be understood is the resurgence of Cabernet Franc in the appellation. As a variety, it is highly aromatic and adds both perfume and structure to a blend with Merlot. Having been widely planted in St Emilion before the brutal frost of 1956, it is now a significant and increasing contributor to the best wines of the Côtes. From the moment we addressed the first wine of the day, we knew that Tuesday was going to be special. Throughout the morning, starting at Château Canon and taking in Troplong Mondot, La Gaffelière, Ausone and Beau-Séjour Bécot, we were constantly seduced by wines that were lush but also pristine, precise and, most importantly, energetic. Canon was intense and profound, and its new sister Berliquet more rigid, yet bright and pure. Troplong Mondot’s new Technical Director, Amyeric de Gironde, is already making his mark with a more relaxed and expressive style that suits 2018 very well. 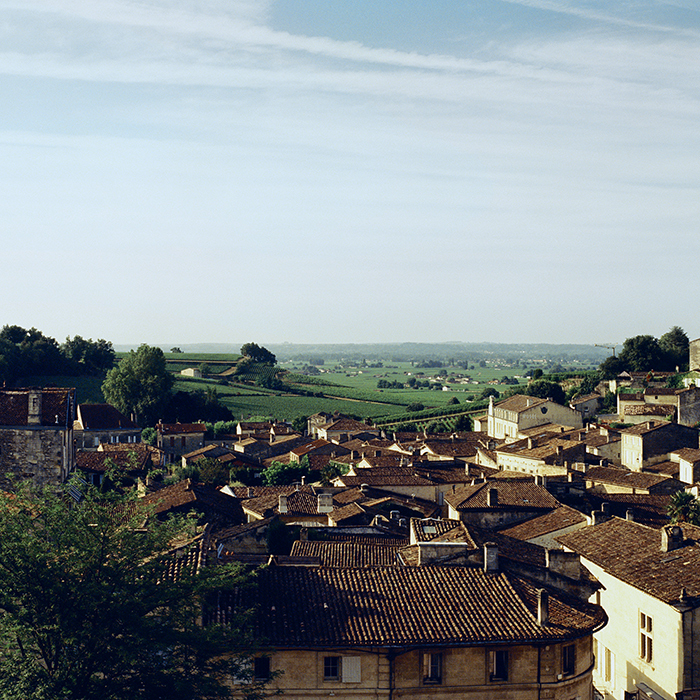 At Gaffelière, ninth-generation owner Alexandre Malet Roquefort is putting his heart and soul into restoring the reputation of his wine at the top of St Emilion’s hierarchy. To prove Gaffelière’s pedigree, we were shown an historic 1955, produced principally from Cabernet Franc and made from the last vintage before the famous frost. At Ausone, Alain and Pauline Vauthier’s range was as impeccable as ever and the morning was completed at the renascent Beau-Séjour Bécot, where Juliette Bécot and her husband Julien have completely re-energised this potentially superb estate. These and the other wines tasted today prove not only that the Côtes of St Emilion are making wines of breed and elegance again, but also that 2018 is a really fine year for this appellation. The soils of St Emilion’s neighbour Pomerol are clay-rich and also water-retentive, but lack the St Emilion Côte’s limestone. Here the style of the vintage is more hedonistic and powerful, but therefore also very typically Pomerol. There is no doubt that 2018 is a very good year for Pomerol as well, with La Conseillante, Evangile and Clinet all impressing. Pétrus is Pétrus, of course, but the wine of the day in Pomerol was Vieux Château Certan, where Alexandre Thienpont has triumphed with a wine that is both intellectual and crowd-pleasing. A final word for Cheval Blanc and Figeac, outliers in St Emilion and bordering Pomerol, but with gravels in their vineyards: here the style seemed to be more aligned to yesterday’s Left Bank wines, with their heady and spicy allure. Both are majestic in their own ways, but the day belonged to St Emilion, its limestone slopes and Cabernet Franc. Our team is out in the region all week; read all our coverage of Bordeaux 2018 here.